Samia El Jaafari, co-founder, Intro, shares her experience of following her heart and intuition in business, bringing her face to face with her natural leadership as an entrepreneur. 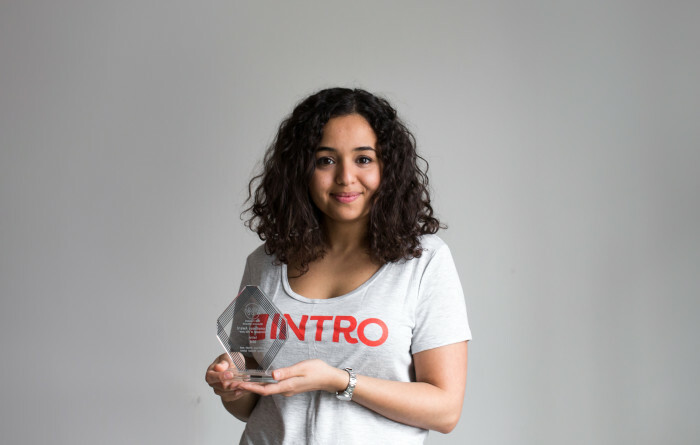 Samia El Jaafari is the founder of Intro, a start up bringing recruitment up to date for the millennial generation. We first met at YENA Bristol where she was speaking with her Intro co-founder, Reza Saeedi. She was clearly smart, bright, captured my attention. And she was standing behind Reza, hiding a natural ability to engage and inspire an audience. Pure potential. We worked together for 10 Business with Heart Coaching Sessions focusing on Samia’s true nature, purpose, message and visibility. She flew, naturally generating opportunities to speak, write and share her message. She won a high profile Award; doubled the traffic and engagement on Intro’s website; and confidently stepped more into her role as founder and leader for Intro. And my personal highlight was returning to YENA 6 months later to see Samia speak solo. She held the audience in the palm of her hand, spoke naturally with connection and engagement, delivered her message clearly and smartly, and at the end of the talk every single hand shot up in the air with a question. I’ve learnt to let go of the fear of not being fully ready. This means I’ve gained a lot of confidence to open up and vocalize what is on my mind and in my heart, which has been received very positively. For example, when I spoke at YENA, or when I let my creativity and energy loose to populate the website with engaging content and we doubled our traffic month on month since then. I’ve created opportunities that allow me to be myself and share the messages that I care about. The way I interact with people has changed – I’m much clearer about what I’m doing and I don’t hesitate or wait to take action. I’ve created speaking opportunities, the website and business have been growing. When I choose to take action guided by my intuition I’ve always seen the impact very quickly on the business, on the website and in the way people interact with us. There is almost an instant impact, which has been enough to get rid of the voice saying it’s too risky, you’re not ready. I’m challenging myself or it wouldn’t be growth. Myself. I was skeptical in the beginning as to how possible it is to align your work with your personal purpose. I now know you can always choose to do that and find meaning in what you do. This is something I will always do from now on, even if I work for a company and stop being an entrepreneur. It is very important to assess your personal purpose and align it with your work. It is crucial to find happiness and fulfillment through your work – it’s the key to keeping you going and making you better at what you do. I also gained confidence, confidence to open up and say how I feel and what I think about the work I’m doing, making sure that it has the impact I want it to have. Where has this led you? What are you going to create now? It has led me to consider my leadership and a style of leadership that is my own, that I’m satisfied with. Being able to lead people to do good is your responsibility as a business owner and entrepreneur. I need to be able to provide a good work environment, opportunities, and growth, be confident and have positive energy to share with other people. It is very important for me to create a company that people are drawn to. It is essentially what we encourage other companies to do and I want to practice what I preach at Intro. It is the first time I’m confronted with this feeling and conscious of it – how good can I be as a leader? If you’d like to build your business around your true nature, purpose and power; to share your message and grow your visibility, audience and impact join me for Business with Heart Coaching or book an exploration session.